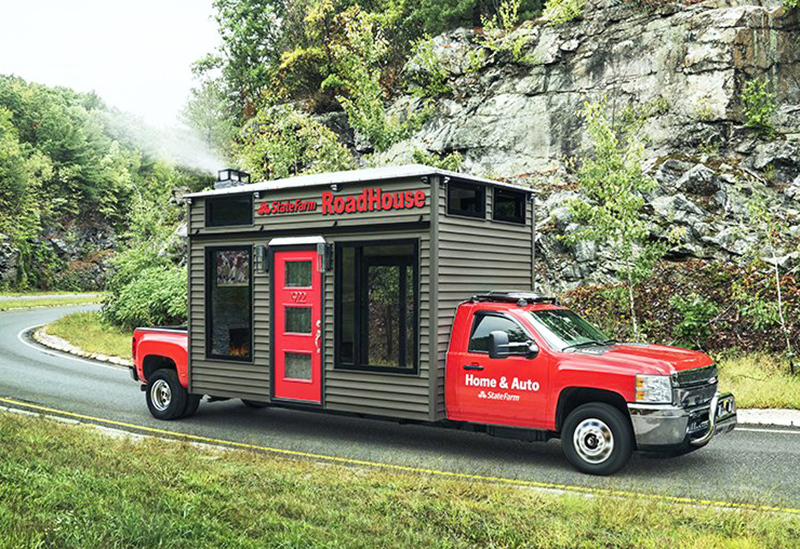 State Farm created a physical manifestation of combined home and auto insurance coverage with the RoadHouse, a “tiny house” on an extended 15-foot Ford F350 Dually pickup truck that’s engaging tailgaters at NFL games this football season. With an activation and real-time content promoted via #Housegating and #Trouse, State Farm is hoping to capture the attention of fans on-site while enhancing the game day experience for fans at home—fans who love their big-screen TVs and are “housegating” in their living rooms. The program kicked off at Lucas Oil Stadium in Indianapolis on Sept. 11. On-site at the stadiums, consumers walk up the stairs and enter through a real front door into the tiny house as smoke puffs out from the attached chimney, triggered by remote. The interior features a stone accent wall, a smart TV on the wall that broadcasts the game live or switches to a digital game, and lockers displaying team jerseys and artifacts. Consumers can walk out into the “backyard” through sliding doors onto a deck to play yard games like corn hole. 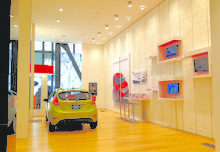 State Farm representatives are on hand to chat with consumers in a low-pressure environment. To engage fans at home, State Farm created a Housegating Playbook with instructions on creating their own game-day experiences. Consumers can check out 360-degree video of the RoadHouse and video showing construction of the build. 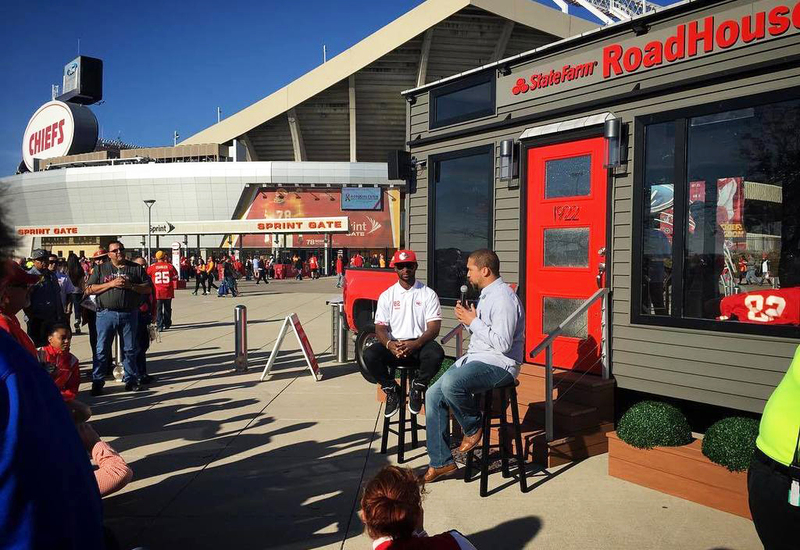 To further push the experience beyond the bounds of the stadium, State Farm created commercials around the vehicle and has hosted media outlets and NFL team partners at the RoadHouse for live broadcasts and Facebook Live features. For fantasy football fans, State Farm offers up live Q&A segments filmed on-site in the RoadHouse, offering last-minute tips for lineup changes. The State Farm RoadHouse has made 14 stops to date, with more than 15,500 consumer engagements recorded. 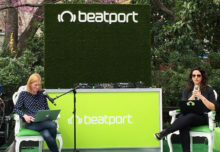 Video content surrounding the activation has received 33.6 million views across Facebook, Twitter and Instagram. 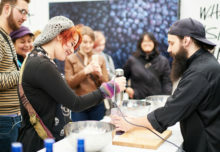 “This program has really provided different outlets for us to connect authentically with football fans, and also help drive home the message that beyond game day, we’re available to help in other ways with life experiences and the most relevant life experiences for these consumers are tied to home and auto,” says Mandy Laux, manager-sponsorships/experiential at State Farm. Agency: The Marketing Arm, New York City. Build: Turtle Transit, Hudson, MA. The RoadHouse is a “tiny house” set on an extended 15-foot Ford F350 Dually pickup truck that’s engaging tailgaters at NFL games.